Are you a first-time 39er? Welcome to the club! Seriously … don’t fret … 39 and Holding is a badge of honor, not a lamentable milestone. This is the moment in life when you’ve accrued enough wisdom and knowledge to pursue your lifelong passion, or discover the passion that will enhance the rest of your life! Or … are you 39 and Holding … again?! Yahoo! you’re enjoying freedom of the mind and the joy of ATT-i-tude. 13th: even beating out The Beatles for a while, Barry Gibb’s prolific songwriting passion finally paid off. He climbed the music charts to become the only songwriter to grab Billboard’s top spot with four consecutive #1 singles. Barry eventually expanded that to six #1 tunes, and shares the record with Lennon and McCartney. He kinda had a push up the charts—it all started on a Saturday night in December 1977. 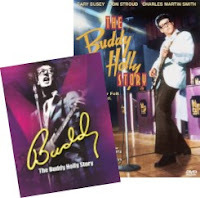 18th: more movie magic came in the release of The Buddy Holly Story, starring Gary Busey. It picked up the Academy Award (1979) for Best Music and several more; and solidified Gary as a bona fide major Hollywood player, in his nomination for Best Actor in a Leading Role. Doesn’t it seem to you that the best movies include Rock & Roll?? Just like moms and May flowers, MAY 39ers are multi-faceted with complexity to match. Deliberate and down-to-earth Taurus (April 20-May 20) transforming into quick-witted and chatty Gemini (May 21-June 20) is a big leap. Even if your mom or other loved one is on the cusp and caught between, you gotta love ‘em anyway! What’s the point of eating healthy and exercising? Who wants to live to be 89?